As composer he has been awarded with several prizes (« Michele Pittaluga – Città di Alessandria » – Italy, 1997 – ; « Paolo Barsacchi » – Italy, 1997 – ; « Il fronimo – Suvini Zerboni » – Italy, 1998 – ; « Ciudad de Montevideo » – Uruguay, 1998 – ; « Carrefour mondial des guitares » – Martinique, 1998-). Ourkouzounov has written over 100 works for guitar—solos, duos, trios, quartets, instrumental ensembles, and two concerti—a number of which have won important prizes, and a majority of which have been published by leading publishers (Doberman-Yppan , Henry Lemoine). Several internationally recognized performers have played his works. Among them Zoran Dukic, Denis Azabagic, Scott Tennant, Shin-ichi Fukuda, Alberto Vingiano, Eduardo Isaac, Pablo Marquez, Antigoni Goni, Duo Gruber-Maklar, Miscelanea Guitar Quartet, Los Angeles Guitar Quartet, Thibault Cauvin, Dimitri Illarionov, Jérémy Jouve , Gabriel Bianco , Carlos Perez, Juan Carlos Laguna , Thomas Muller-Pering, Duo Palissandre, Ensemble Nomad, Patrick Kearney, etc. 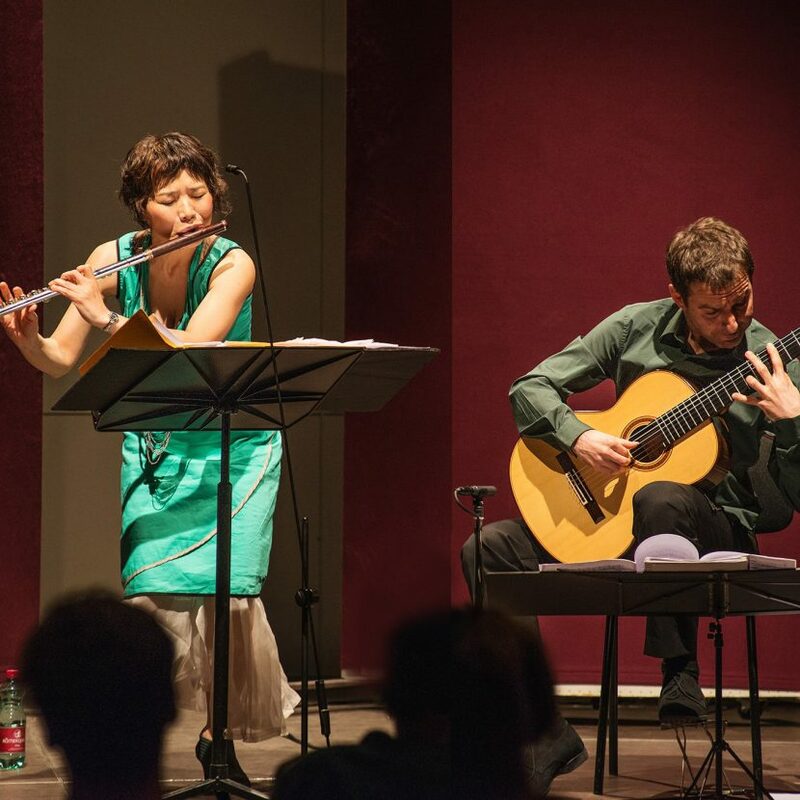 Atanas Ourkouzounov performs widely as soloist and with the Japanese flautist Mie Ogura. In addition to eight CDs on which Ourkouzounov plays, more than 50 CDs of his music performed by others are currently available. Ourkouzounov is also in demand as a teacher and juror at conferences and conservatories in Europe, USA, Canada, China and Japan and he holds a full-time position at the Conservatoire “Maurice Ravel” in Paris. Born in Japan 1973, Mie Ogura started very early to play piano at age of 3, flute at age 7. After obtained an contemporary improvisation prize, she also inserested many others language to improvise,she continued to study the baroque flute with Pierre Séchet and jazz improvisation with Glenn Ferris, Jean-Charles Richard, as well as indian music with Patrick Moutal. She is passionate about teaching,edited the jazz flute beginners book « Flute Jazz Coffeebreak »,published in 2005 at Edition Trim(Japan). Actually Flute and Improvisation professor at the Conservatory of city of Paris“Jacques Ibert”. Edmauro de Oliveira wurde in Guaratinguéta (Brasilien) geboren. Er studierte Musik mit Hauptfach Gitarre an der Universität São Paulo und erwarb im Jahr 2004 das Konzertreifediplom an der Hochschule für Musik Winterthur und Zürich in der Klasse von Jury Clormann. Er gewann verschiedene Musikwettbewerbe, u.a. war er Stipendiat an den Meisterkursen von Santiago de Compostela in Spanien und Träger des Förderpreises vom PROJETO NASCENTE. Von 1998 bis 2000 hatte er einen Lehrauftrag in São Paulo, seit 2009 unterrichtet er am Konservatorium Winterthur. Er war an verschiedenen CD-Aufnahmen beteiligt und gilt als exzellenter Bearbeiter und Interpret von Gitarrenmusik. Er tritt in verschiedenen Formationen im In- und Ausland auf, so u.a. im Opernhaus Zürich, mit dem Orchester il mosaico, den Roland Fink Singers, Gufo Reale, Bachdança, Rodrigo Botter Maio, João Bastos. 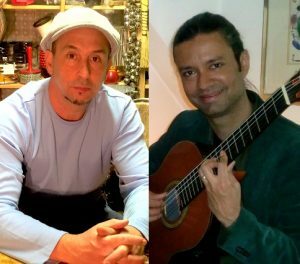 Marc Sway, Toni Martinez, Rodrigo Botter Maio und vielen anderen grossen Musikern aus der Welt der «Latinmusic».